Connolly back in at center. This competition is for real you guys. I like Jimmy Garoppolo's fakes. He even fakes the screen after a hand-off. Nice touch. Sweet pitch and catch between Jimmy G and LaFell. I think Jimmy Gameday might stick. Well hello Brandon Bolden. I see you're not giving up. 18 yards on first carry. Brandon Bolden with an 18-yard run. Firmly on the bubble and needs to make plays like that to stay alive. Wow. Not sure who Jimmy G was throwing it to there. Amendola was right in front but LaFell catches in the back for a 4-yard TD. Ryan Mallett is officially on notice. Jimmy Garoppolo with a bullet pass to Brandon LaFell, who beat Brandon Marsh for the touchdown. Garoppolo — so hot right now. NE scoring drive: 13 plays, 75 yards, 4-yd TD pass. Brandon LaFell said he wanted to be a red zone guy for the Patriots. Well, there you go. 3-4 may still be the "base" defense for the Patriots, but four-man line still prevalent in nickel fronts. #Eagles turn the ball over on downs following a wide right FG attempt. Patriots to begin this drive on their 37. Eagles' Alex Henery misses a 47-yard attempt wide right. Patriots take over. Not a good outing for Philly. But they've done it without a lot of starters. So blocked punt. I'd put that on LB Darius Fleming. Picked the wrong Eagle to pick up before releasing to go down field. Chung got the big hit but he was there a half-step late. Looked like some confusion between Tyler Ott and Darius Fleming as to who was going what way. Both were responsible for the blocked punt. Nick Foles with a 6-yard TD pass to Zach Ertz. 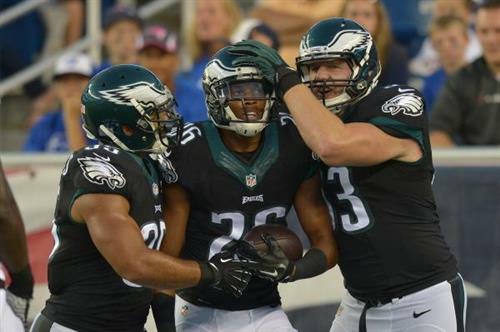 PAT is good and #Eagles cut down on Patriots #PHIvsNE lead: 21-14. Patriots flagged for one of those new roll block penalties. Marcus Cannon the perpetrator.